When you're a kid, having fun is our job! Olympia oasis occupies 2 km of Greece’s longest sandy beach – perfect for watersports, swimming and beach games with unspoiled nature and thick, golden sand, ideal for building sandcastles. A multi-activity camp is operating for our younger guests during high season. 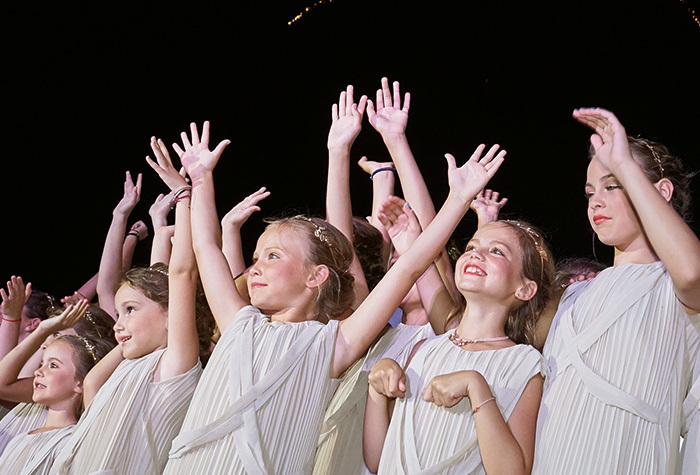 The Kids' Club creates a magical holiday experience for children aged 4-12 years. Children at Olympia Oasis enjoy a dedicated holiday programme so that adults can relax. You’ll find: children’s adventure playgrounds and villages, toys and facilities made from environmentally safe materials, qualified personnel, creative activities with fun and games, teenager programme with the emphasis on sports and competitions, shows for children and teenagers. Children under 4 yrs. are welcomed to use the Kids Club facilities, but must be supervised at all times by parent or guardian. From morning to night, there is plenty to keep teens occupied. From beach volleyball, basketball, mini football, archery, water polo, tournaments, parties and more. Children up to 14 years old stay free in the parent’s room depending on each room’s capacity. Choose between a wide range of family accommodation.